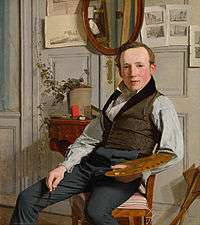 The Danish Golden Age covers a period of exceptional creative production in Denmark, especially during the first half of the 19th century. 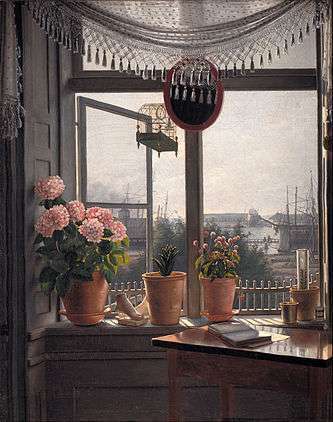 Although Copenhagen had suffered from fires, bombardment and national bankruptcy, the arts took on a new period of creativity catalysed by Romanticism from Germany. 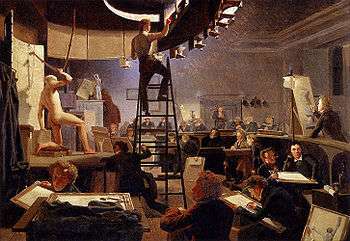 The period is probably most commonly associated with the Golden Age of Danish Painting from 1800 to around 1850 which encompasses the work of Christoffer Wilhelm Eckersberg and his students, including Wilhelm Bendz, Christen Købke, Martinus Rørbye, Constantin Hansen and Wilhelm Marstrand, as well as the sculpture of Bertel Thorvaldsen. 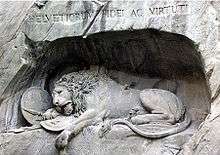 The origins of the Golden Age can be traced back to around the beginning of the 19th century. Surprisingly, this was a very rough period for Denmark. Copenhagen, the centre of the country's intellectual life, first experienced huge fires in 1794 and 1795 which destroyed both Christiansborg Palace and large areas of the inner city. In 1801, as a result of the country's involvement in the League of Armed Neutrality, the British fleet inflicted serious damage on the city during the Battle of Copenhagen. In 1807, on rumours that the French might force Denmark to close the Baltic to their shipping, the British once again bombarded Copenhagen, this time specifically targeting the city and its civilian population. 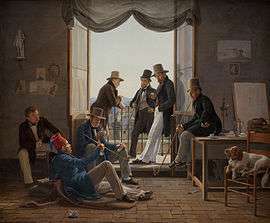 Then in 1813, as a result of the country's inability to support the costs of war, Denmark declared a State bankruptcy. 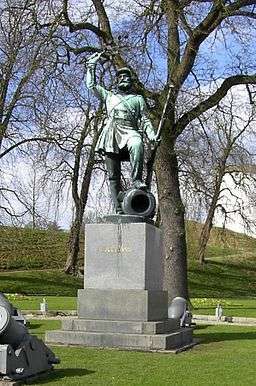 To make matters worse, Norway ceased to be part of the Danish realm when it was ceded to Sweden the following year. ↑ "Pengereformen, der blev kendt som statsbankerotten", Nationalbanken. (Danish) Retrieved 30 August 2010. 1 2 "Historical overview", Guide to the Danish Golden Age. Retrieved 30 August 2010. 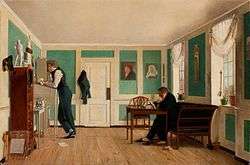 ↑ "Danish art before 1900", Aarhus Kunstmuseum. Retrieved 30 August 2010. ↑ Arkiv for Dansk Litteratur - Henrich Steffens - Forfatterportræt, (Danish). Retrieved 30 August 2010. ↑ J. Wadum, M. Scharff, K. Monrad, "Hidden Drawings from the Danish Golden Age. Drawing and underdrawing in Danish Golden Age views from Italy" in SMK Art Journal 2006, ed. 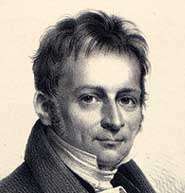 Peter Nørgaard Larsen. 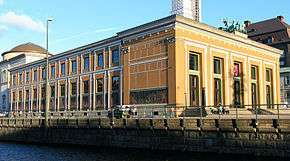 Statens Museum for Kunst, 2007. ↑ Lise Svanholm, "Malerne på Skagen", (Danish), Gyldendal 2001, pp 30–43, ISBN 87-00-75184-7. 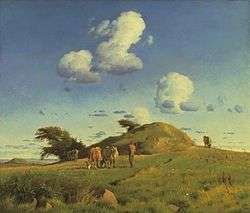 ↑ "Landscape and Architectural Painting", Guide to the Danish Golden Age. Retrieved 28 August 2010. 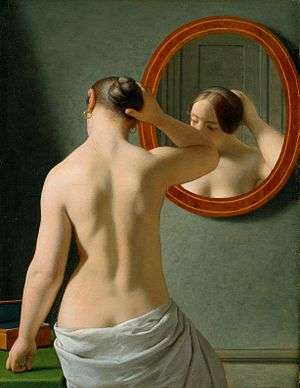 ↑ "Genre Painting", Guide to the Danish Golden Age. Retrieved 28 August 2010. ↑ "Sculpture", Guide to the Danish Golden Age. Retrieved 29 August 2010. ↑ "Architecture", Guide to the Danish Golden Age, Retrieved 28 August 2010. 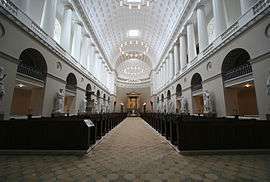 ↑ Christiansborg Palace Chapel. From Guide to the Danish Golden Age. Retrieved 28 August 2010. ↑ "Andreas Hallander", Den store Danske. (Danish) Retrieved 1 September 2010. ↑ "Gamle Danske Sange - med melodi af J. P. E. Hartmann". (Danish) Retrieved 28 August 2010. ↑ "Danish Choral Music", DanishMusic.info. Retrieved 28 August 2010. ↑ "Gade, Niels W.", Eclassical.com. Retrieved 28 August 2010. ↑ "The Bourgonville website." Retrieved 28 August 2010. ↑ "Guide to the Danish Golden Age: Literature". Retrieved 25 April 2010. ↑ "Adam Oehlenschläger", Den store Danske. (Danish) Retrieved 28 August 2010. ↑ "Bernhard Severin Ingemann", Guide to the Danish Golden Age. Retrieved 28 August 2010. 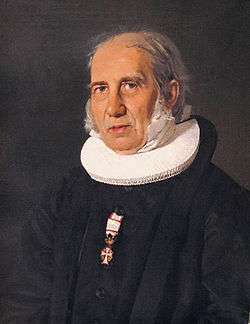 ↑ "N. F. S. Grundtvig", Archiv for Dansk Litteratur. (Danish) Retrieved 28 August 2010. ↑ Liukkonen, Petri. "Hans Christian Andersen (1805-1875)". Books and Writers (kirjasto.sci.fi). Finland: Kuusankoski Public Library. Archived from the original on 10 February 2015. ↑ Liukkonen, Petri. "Søren Aabye Kierkegaard (1813-1855)". Books and Writers (kirjasto.sci.fi). Finland: Kuusankoski Public Library. Archived from the original on 10 February 2015. ↑ "Søren Aabye Kierkegaard (1813-1855)", Philosophy Pages. Retrieved 28 August 2010. 1 2 "Hans Christian Ørsted", Guide to the Danish Golden Age, Retrieved 28 August 2010. ↑ "Hans Christian Andersen", Magill's Survey of World Literature, Salem Press. Retrieved 1 September 2010. ↑ "Aluminium", ChemiCool. Retrieved 1 September 2010. ↑ http://www.nationalgallery.org.uk/whats-on/exhibitions/kobke "Christen Købke —Danish Master of Light", National Gallery, London. Retrieved 1 September 2010.